My favorite regions in Africa for shooting tropical pictures of animals and African scenery and people include the Masai Mara and Samburu Game Reserves and the Nakuru National Park in Kenya. Kenya has an extraordinary variety and abundance of wildlife, both African wild animals and birds and is a photographer’s dream for shooting wildlife photos of Africa or photos of Masai warriors. It is striking to be able to observe and photograph African wild animals such as the African lion going about their business as if humans did not exist. 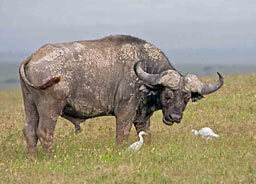 I feel privileged to get so close to African wild animals and to be able to share their habitat. 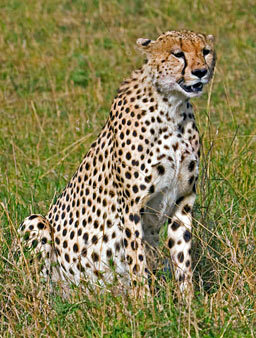 East Africa is one of the few places left on earth where one can observe large predators and capture tropical pictures of animals in the wild. In the "Africa - Big Cats" galleries you will see a large and varied number of wildlife photos of Africa’s big cats: Cheetahs, African lions, Leopards and many cute and playful cubs. For these predators, the Kenyan plains offer a vast and diverse food chain to feed themselves and their cubs. It’s really fun to observe the cubs. They behave just like human children: playful, energetic and mischievous. Siblings are as different in their character traits as children can be. The female African lions are wonderful mothers as they care for, teach and patiently play with their cubs. In the "Africa - Animals" gallery you will find other African wild animals: Elephants, Hippos on the Mara River, Masai and Reticulated giraffes, Zebra, Impala, Topi, and many other tropical pictures of animals. 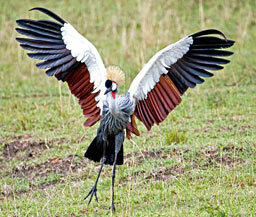 Kenya has an extraordinary variety and abundance of birds, approximately 1300 species. They are very colorful, many unique to East Africa and I have tried to capture many of my favorites in the "Africa - Birds" gallery. The vast number and species of Eagles are amazing and birds such as the Lilac-breasted Roller and the Secretary bird make Kenya a birder’s paradise! In the "Africa - The Masai People" gallery, you will also find photos of Masai warriors and Masai tribesmen in their village, performing ceremonial dances and going about their daily chores. They wear bright cloth, with a lot of red, and the effect is visually stunning. The photos of the Masai warriors show young men singing a haunting, repetitive chant and jumping with great energy. The women are even more colorful and demonstrate some of their skills, including building the family hut and selling woodcarvings and jewelry.